Call of Duty never used to be about Modern Warfare and CODBLOPS, it is a series that used to have a sense of seriousness surrounding it, a of gritty down-to-earth realism. 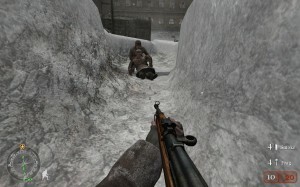 I’ve been playing one of the lost souls of the series, Call of Duty 2. While it is a title which may not have such an awe-inspiring sequence as the introduction to Stalingrad that we saw in the first game or the voice acting of Kiefer Sutherland from World at War, it did have World War Two and Captain Price. 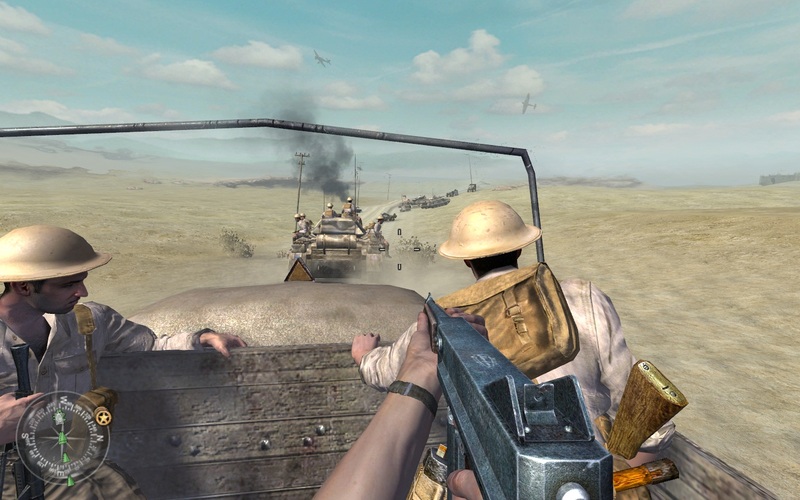 Let’s get one thing straight, Call of Duty 2 isn’t the best game in the world, it has some of the faults that have run through the entire series – incessant ‘nade spam from the AI and the traditional linear shooter fault of waiting for you to cross an invisible line to spawn new enemies – but importantly, it came before the over the top story lines that emerged in Modern Warfare became a staple of the series. What’s more is that this was only the second Call of Duty set in World War Two, by the time World at War came around, sandwiched in between the Modern Warfare’s it was the fourth Call of Duty to use the World War Two setting. At the time it was still something of an original setting, especially so when you appreciate you aren’t set up as a super-hero style soldier that you found with some of the Medal of Hono(u)r games. The game starts really smoothly, in something which is a bit of a bugbear for me; the tutorial works its way into the game proper extremely well. You are a new recruit arriving near the front lines in Moscow ready for some last minute training from the Commissar. After squeezing off a few rounds and throwing some potatoes, they Red Army couldn’t afford to waste live grenades, a soldier approaches and informs the Commissar that a prisoner has been brought in for questioning. As the questions start another soldier arrives in a great panic revealing that a German attack is taking place, you leave the room with the prisoner and enter the battle. Now -that- is how you do a training level, it works oh so well and provides a seamless transition from learning the basics of combat to letting you get at the action proper, why more games can’t do this I don’t know, you would think it is something that would be a priority to get right as it is the first part of the game many people will play and it sets the scene for the rest of the game. If you can hit the nail on the head here I find the rest of the game has a good chance of following in a similar vein. As you play through the single-player campaign you can see where some of the big scenes from the Modern Warfare games came from, trundling down across the desert to attack a German held port in Egypt is quite an awe-inspiring experience, and it is a memory that has stuck in my mind from when I played Call of Duty 2 back when it was released. The key thing is, these kinds of events didn’t feel forced like they started to in World at War and Modern Warfare 2, they felt like part of the natural flow of what would have happened during the war. 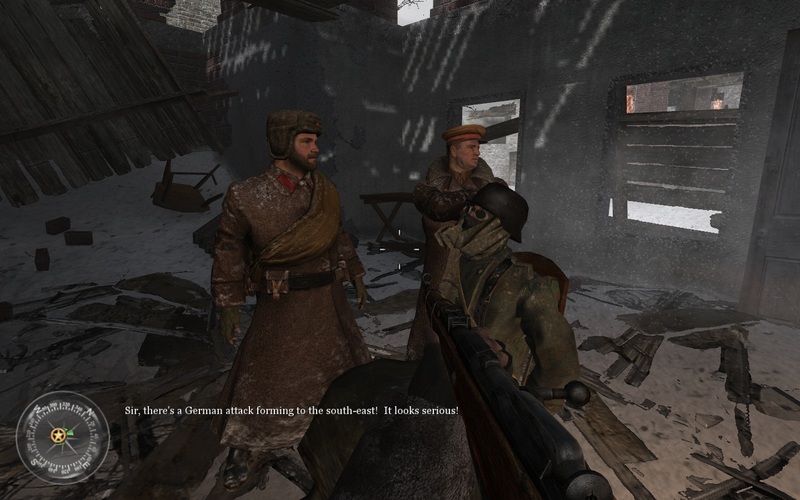 Switching to multiplayer provides a welcome breath of fresh air, this was a time before perks and experience points, heading back to the online play in Call of Duty 2 is a stark reminder of how pure and how simple first-person online gaming used to be. Select a side, a weapon set and go forth to fight for that number one spot or to capture the all important flag. This isn’t to say that the fancy stat system we get in the recent Call of Duty’s is bad, just that at times you can do away with what is in reality superfluous junk and get down the meat and bones of the action. It is sad to think that Call of Duty 2 is now something of the forgotten child of the series; everyone will remember the original game for starting everything off and the Modern Warfare’s for taking things ultra-mainstream. Who will remember number two? If nobody else does, I will. This is sadly true, I wish the COD series could remain some of this essence rather than running around, shoot, die, respawn. CoD2 was a really good game for it’s time.